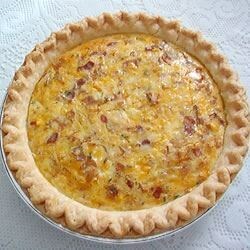 "Bacon, eggs, and cheese, all blended in a pie crust!" Place bacon in a large, deep skillet. Cook over medium high heat until evenly brown. Drain (reserving 1 tablespoon of grease) crumble bacon and set aside. Heat reserved bacon grease in skillet and saute onion until soft. In a large bowl, beat together eggs, milk, flour, parsley, thyme, salt and pepper. Add bacon, onion, mozzarella and cheddar cheese; mix well. Pour mixture into pie crust. Bake in preheated oven for 45 minutes, or until lightly brown on top and firm in the middle. Serve warm. See Chef John makes this classic bacon, leek, and gruyere quiche. This barely filled 1/2 my regular pie shell, and tasted more like scrambled eggs in a pie crust than quiche. Needed way more milk and more cheese!